Perfumed flowers decorate the citrus trees. Roses and geraniums symmetrically carpet the gardens’ surroundings. Breathe in the beauty of the Persian Palace Gardens. 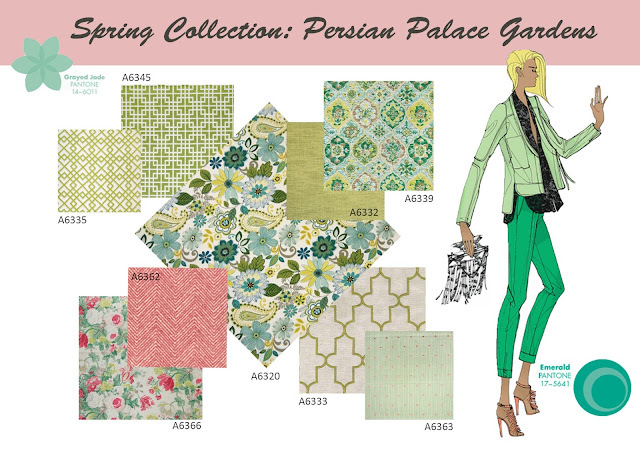 The influence of Arabic art-forms and garden oasis’ embellish these fabrics with beauty and harmony. From symmetrical arches to geometric medallions and trellises, these inspirations have been captured in timeless patterns. The various hues of native precious stones and garden blossoms are evident in colors of aloe, emerald, turquoise, and azalea. These are really lovely !